Where is Commander Cody? | Daddy's in Charge? 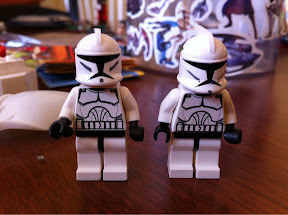 Take a look at these two Lego Clone Troopers. Do you notice any difference between the two of them? Yeah, me neither. Somehow in the mind of my three year old though they are two completely different guys. Now I always thought that Clones were supposed to be exactly the same, but I guess that I was mistaken. I have spent hours looking for Commander Cody only to be told that every guy I find is not him. How am I supposed to find him when the only person that knows what he looks like is Carter? From my vast Star Wars knowledge I know that this guy is not a clone trooper so there is no way that he could be Commander Cody or could he? Everyday he seems to be a different guy. I have completely lost track of what he looks like now because he looks nothing like he did yesterday. 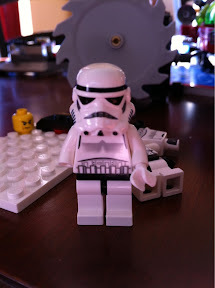 At last count my house had around 387,453 Lego pieces and that includes a full 7,523 minifigures half of which are clone troopers and only one that is Commander Cody. Yeah we have way too many legos but the kids love them especially the Star Wars ones. They keep making new ones thanks to the animated Clone Wars series. It really is endless because they can introduce a new character every week, some that we have never heard of, and low and behold there is a new Lego set introduced within a month. 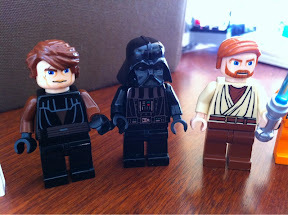 I should have bought stock in Lego years ago, I probably would be some sort of majority share holder by now. Of course as a former child who LOVED Legos I have no problem with this, except for the mess in my basement. 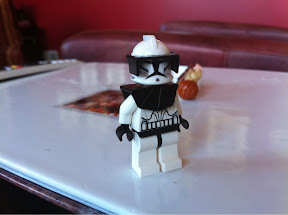 It seems that every set comes with a clone trooper. We probably have more clones than the actual clone army. The only problem though is that some have no heads, others have no arms, and others have only one leg. 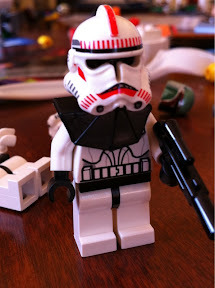 Carter likes to mix and match to create his clone trooper so I never know what an actual one looks like to him. He can be a very creative kid with these little guys, I sometimes think they are his best friends. He might not know how to fully count to ten yet or know his ABC's but when it comes to Legos he does know his Clone Troopers. You or I might not think this guy looks like him but to Carter this is exactly what Commander Cody looks like... At least today.